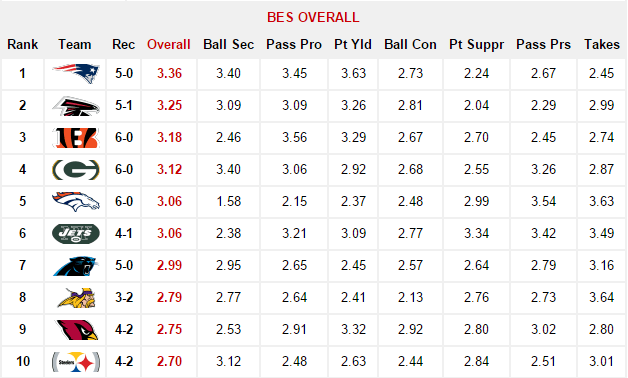 As the regular season nears its midway point, the frequency of key divisional clashes will increase thus dramatically altering the face of the BES rankings. However, as it stands the BES Top-10 remains intact for a third consecutive week, allowing no new teams to enter its ranks. The Patriots (5-0) have now stretched their reign at No. 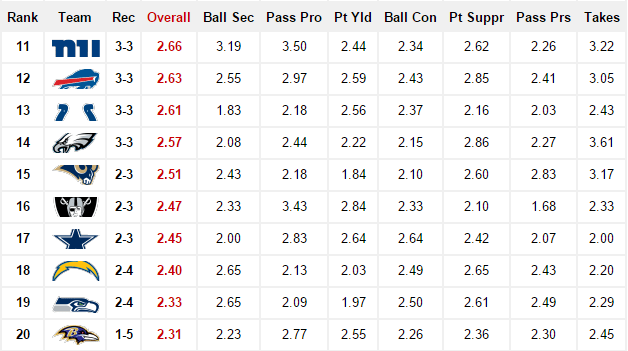 1 to three weeks, the longest stint atop the rankings thus far this season. 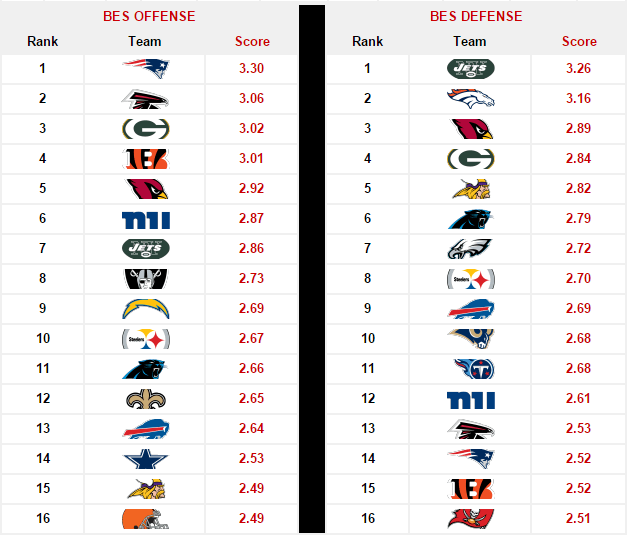 However, in Week 7 they draw the Jets (4-1) who placed sixth in BES Overall with a score of 3.06. That game will feature the Patriots No. 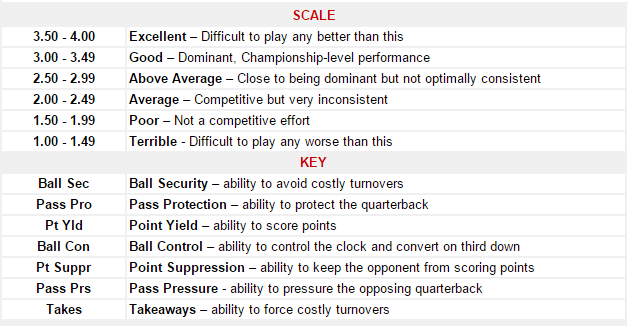 1-ranked BES Offense (3.30) against the Jets No. 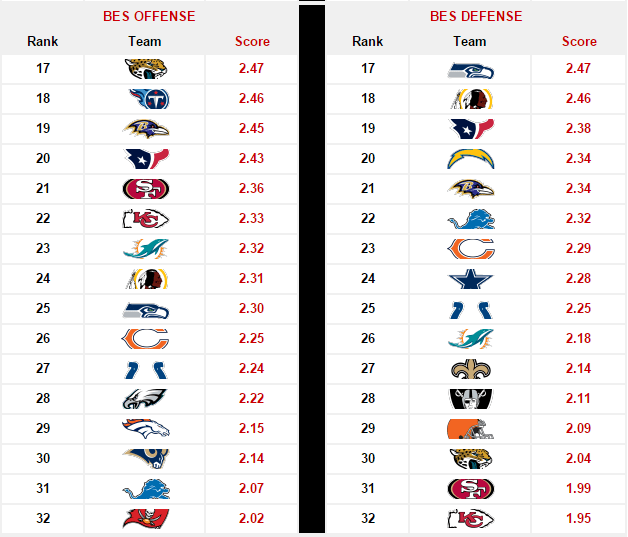 1-ranked BES Defense (3.26). The Steelers (4-2) 25-13 win over the Cardinals (4-2) helped them retain their No. 10 spot for the fifth consecutive week. As a result, the Cardinals fell to No. 9, replaced by the Vikings (3-2) at No. 8. Just outside the Top-10 we find a cluster of 3-3 teams at No. 11-14 knocking at the door. The Colts (No. 13) are the biggest surprise of that group after a monstrous jump from No. 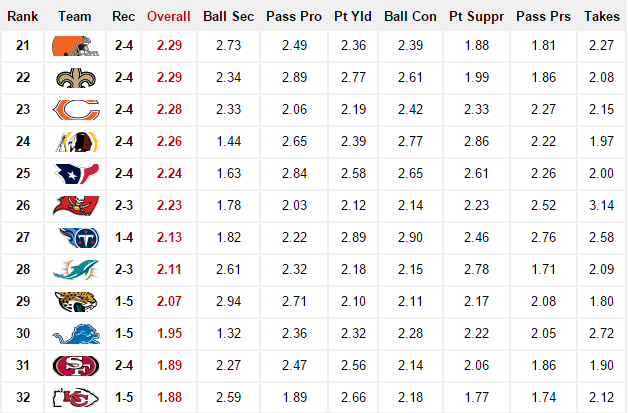 25 in our Week 5 rankings. In Week 7, they welcome the Saints (2-4) who made a leap of their own, from No. 27 to No. 22, after upsetting the No. 2-ranked Falcons (5-1) in Week 6. At the bottom of the heap are the Chiefs (1-5) at No. 32 after five consecutive losses. Their BES Overall score of 1.88 belies the talent on the roster, particularly their defense which is also ranked 32nd by the BES. They host the Steelers in Week 7, a daunting opponent for a last place team looking to reverse its fortunes. Alright this week my bias is coming out, man we should be at least 8 after holding a team that’s been averaging 40+ points in victories this season to 13. But I guess I’ll take top ten. Chiefs pull off the upset? You might as well say young thug is a 5 mic mc! It’s not go happen bruh lol!! “Everytime they see me, somethin wrong wit they memory”….